Standing Room Only nearly lived up to its name Friday, as its evening performance of Big River filled most of the seats in CPAC’s Van Fleet Theatre. Hopefully, that means there’s a market for the ambitious programming the troupe has been tackling of late. Or maybe it simply means people have an undying love for the tale whose source material is often considered the Great American Novel: Mark Twain’s The Adventures of Huckleberry Finn. Adapted by William Hauptman (book) and Roger Miller (music and lyrics), the Tony-winning musical again sends its scruffy title character and a runaway slave named Jim down the Mississippi on their respective quests for adventure and freedom. One of the gutsiest things about SRO’s production is also the reason parents might want to prepare their youngest children for the experience. Like Twain’s novel, but unlike an expurgated version I saw many years ago, it allows characters to spout the most racist term in the American vocabulary. The word can sound jarring to modern ears, but it’s probably necessary. That’s because the story depends on a frank portrait of 19th century attitudes to underscore its central lesson. Huck begins the tale as a rebellious lad who nonetheless accepts the morality of his pre-Civil War era when it comes to the subjugation of black Americans. Indeed, he’s so convinced slavery is a holy institution that he worries he’ll go to hell if he helps Jim escape. Both the novel and the musical are most moving when they show the boy reassessing his position after getting to know Jim as a human being. Miller’s songs are sometimes stirring but mostly laid-back and pleasant, especially when accompanied by SRO’s old-timey quintet. Performing under music director Chipper Snow, it’s dominated by Ted Reich’s wistful harmonica and Jordan Shear’s lively fiddle. As for the vocals, there are a few pitchy moments, but most cast members are up to the challenge. That’s especially true of the two male leads. Caleb Baker (as Huck) and Brandon Buchanan (as Jim) harmonize beautifully on duets such as Muddy Water and Worlds Apart. Acting-wise, their styles are a bit less harmonious. Though Buchanan’s Jim reflects the tension and fears of a man determined to float his way to freedom, Baker’s Huck is unrelentingly calm. He seems unruffled whether he’s fighting off a knife attack or trying to avoid being tarred and feathered by angry townsfolk. Baker’s physical appearance—he’s taller and huskier than most of the “adults” around him—also undercuts his portrayal of the youth. But that would be less of a problem if he acted more like a frightened teen rather than a laconic good ol’ boy. Several of the supporting players make indelible impressions under Dee Shepherd’s easy-going direction. John Feather is dignified and decent as Judge Thatcher, then abandons both dignity and decency to play the self-described King, a con artist who hitches a ride on Huck and Jim’s raft. Greg Zunkewicz is equally conniving as the King’s companion, the Duke, but he sometimes needed to project more at the performance I attended. Funniest of all is Thor Collard as Huck’s drunken Pap, especially when he’s railing musically against the Gov’ment. Sweetest of all is Ashton Brammer as Mary Jane, who wins Huck’s heart when she becomes the victim of a scheme hatched by the King and the Duke. As Huck’s friend Tom Sawyer, Anthony Guerrini gets across the lad’s addiction to romantic adventures. It’s not his fault that Tom becomes a distraction late in the story. His 11th-hour reappearance is the only instance in which Twain’s Great American Novel becomes a little less than great. Even more than SRO’s recently staged Sweeney Todd, Big River is presented in a bare-bones manner. Designed by Angela Barch, some of the costumes are only vaguely 1840-ish, while the “scenery” consists mainly of a footlocker and a large box. But none of that matters when the production is at its best, doling out sweet music along with a morality tale that retains its power 131 years after it first pricked the conscience of America. 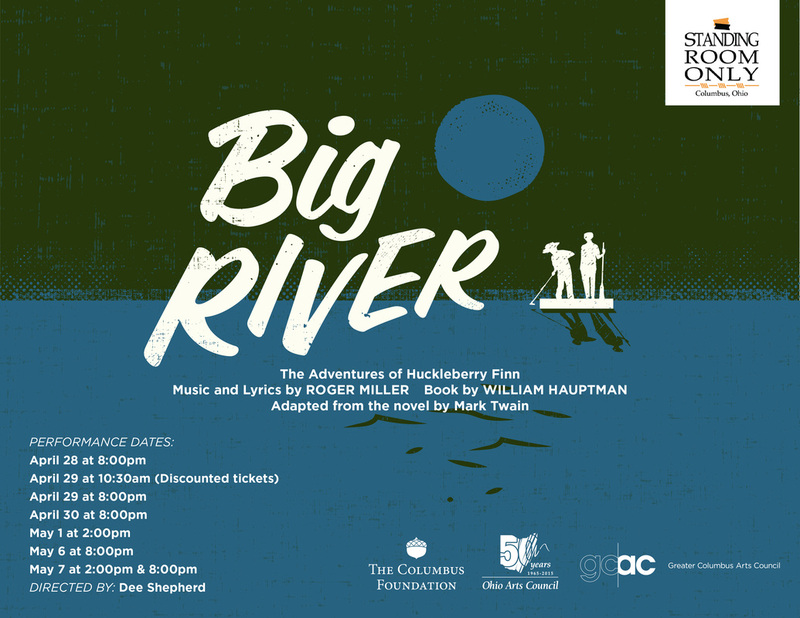 Standing Room Only Theatre will present Big River through May 7 at the Columbus Performing Arts Center, 549 Franklin Ave., Columbus. Show times are 8 p.m. Friday and 2 and 8 p.m. Saturday. Running time: 2 hours, 50 minutes (including intermission). Tickets are $21, $18 seniors (55-plus), $16 members, $12 students. 614-258-9495 or srotheatre.org. If Columbus barbers have noticed a drop in business recently, it could be because the local theater scene is offering not one, but two productions of the bloodthirsty musical Sweeney Todd: The Demon Barber of Fleet Street. Those whose taste tends toward the grandiose might want to check out the Ohio State version being presented this weekend at Mershon Auditorium. Those who favor more intimate productions might prefer the Standing Room Only production whose two-week run ends Sunday. I’ve seen the latter, and I can recommend it with one caveat: The unamplified lyrics are sometimes hard to pick out over the accompaniment. That annoyance aside, the production does right by this darkest of musicals, which features a book by Hugh Wheeler and music and lyrics by Stephen Sondheim. In fact, it does brilliantly by the musical, thanks to a well-chosen cast and Patrick McGregor II’s ingenious direction. This is a “black box” production twice over. Not only is the scenery limited to a black backdrop and little more, but the main prop is a black, coffin-shaped box that is continually being moved and upended to serve a multitude of functions. This minimalistic approach might be distracting if McGregor’s cast weren’t so mesmerizing. Following his starring role in Gallery Players’ 2015 production of Les Miserables, Bill Hafner again excels playing a 19th century man who’s suffered years of unjust imprisonment. But don’t expect to find much in common between the two portrayals. Unlike the noble Jean Valjean, Sweeney Todd has vengeance on his mind—vengeance against the judge who sent him away in order to pursue his wife. The former barber’s fury intensifies when he returns to London only to learn that his wife is dead and his daughter has been adopted by that same judge. As portrayed by Hafner, Todd is so overcome by grief and anger that he stumbles around in a state of near catatonia. In effective contrast, Susan Bunsold Wilson radiates manic energy as Mrs. Lovett, the widowed baker who ultimately becomes Todd’s partner in crime. As amoral as she is personable, Mrs. Lovett quickly finds a way to benefit when the deranged barber’s “shaves” start turning into homicides. It’s no coincidence that her meat pies soon become the talk of the neighborhood. Both Hafner and Wilson display strong voices on numbers such as their duets By the Sea and the darkly humorous A Little Priest, in which Todd and Mrs. Lovett discuss the optimum ingredients for a tasty pie. As the dastardly Judge Turpin, Todd Lemmon offers an understated version of villainy that disguises itself under a cloak of piety. Turpin and Hafner join their voices to great effect on Pretty Women, a beautiful song that incongruously arises during a moment of impending murder. A more blatant depiction of evil is offered by Colton Weiss as Turpin’s henchman, the nasal-voiced Beadle. The musical’s second-most beautiful song, Not While I’m Around, is given a dramatic delivery by Layne Roate as the limping, dimwitted Tobias Ragg. Appearing in other important secondary roles are Ethan White as goodhearted seaman Anthony Hope; Taryn Huffman as Todd’s grown daughter, Johanna; and Laura Crone as a beggar woman and a rival barber. An impressively large orchestra provides the accompaniment, though music director Josh Cutting ably replaced it with his keyboard at the matinee I attended. Curtis Brown’s lighting not only establishes mood but is used to shift viewers’ focus from one side of the room to the other during quick scene changes. Filled with dark themes and bloody violence, Sweeney Todd is unsuitable for young children. But SRO’s inventive production makes it a treat for those who appreciate Sondheim’s lovely tunes and graceful lyrics even when they’re sung in the midst of a murder spree. Standing Room Only Theatre will present Sweeney Todd through Sunday (April 10) at the Columbus Performing Arts Center, 549 Franklin Ave., Columbus. Remaining show times are 8 p.m. Saturday and 2 p.m. Sunday. Running time: 2 hours, 45 minutes (including intermission). Tickets are $12-$21 Saturday, $12-$16 Sunday. 614-258-9495 or srotheatre.org. 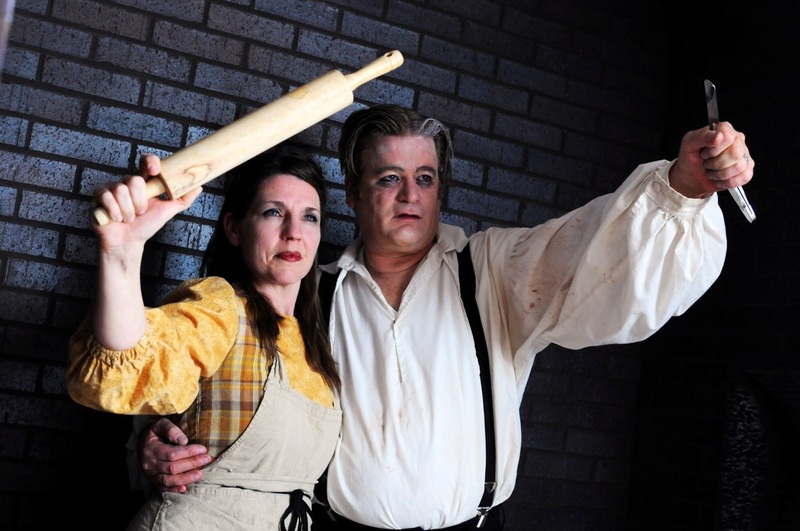 The Ohio State School of Music, Opera and Lyric Theatre will present Sweeney Todd through Sunday (April 10) at Mershon Auditorium, 1879 N. High St., Columbus. Remaining show times are 7:30 p.m. Saturday and 3 p.m. Sunday. Tickets are $20, $10 for senior citizens, students, children and OSU faculty, staff and alumni association members. Show isn’t suitable for ages 12 and under. 614-292-3535 or music.osu.edu.